One of the most noticeable landmarks in Delta Junction is the300-foot microwave tower in the center of town. The land grant for the site where the tower is located was made at the same time the Alaska Highway was built. It served first as a telegraph station, which originated from the work of the famed Billy Mitchell, and was operated by the Army Communications System (ACS). The line was later upgraded to a telephone land line, on poles, which connected all of the major cities in Alaska with the lower 48 states. The Ballistic Missile Early Warning System at Clear Air Force Base introduced microwave repeaters and the site at Delta became a critical link in a system of repeaters. The tower was built in 1960-61. 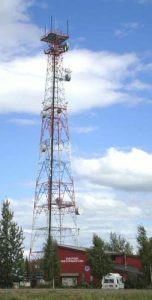 Signals were relayed in two directions – down the Alaska Highway to Canadian repeaters just beyond the border, and to Southeast Alaska where it tied in to a sub-marine cable extending to the Seattle area. Of the four major land microwave links in Alaska, three terminate in Delta. The site is now operated by AT&T Alascom, having passed from the Army to civilian contractors, including RCA, ITT, and RCA/Alascom. Delta is now a hub of land-based microwave communications in Alaska – all long distance telephone calls are handled either by microwave repeaters, satellite or fiber optics. 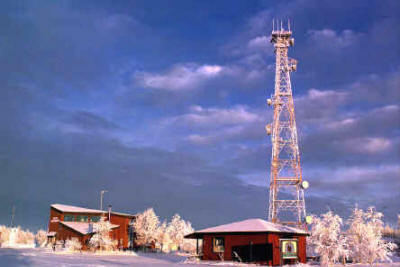 Other microwave repeater sites are situated at various locations in Alaska to complete the links. Alascom’s facilities were upgraded in 1990-92 from transistor-type to digital microwave equipment. Two technicians and two mechanics work at the Alascom site in Delta. Most of the routine functions of this communications site are handled automatically by computers, including the long distance trunks and the military’s AUTOVON line serving Fort Greely.